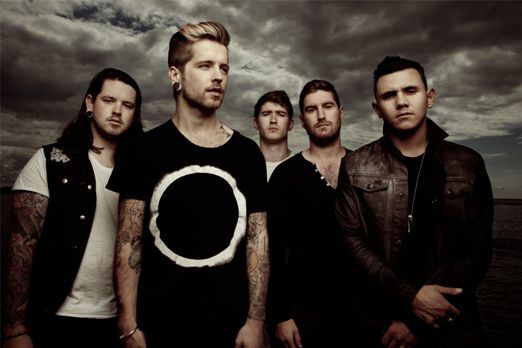 Opening the main stage on the Sunday of Reading Festival 2014, Bury Tomorrow were charged with kicking off a lineup that included We Are the In Crowd, Fall Out Boy and even some vanilla indie acts before headliners Biffy Clyro. Easily the heaviest band on the main stage that day, the stirring of a tired, hung-over crowd in the very early hours of the afternoon was a challenge met with absolute gusto, and perhaps marked the moment that they truly joined the ranks of British metal’s great hopes for the future. Less than a year later, they put out by far the best song they’ve ever penned, incendiary eventual album-opener ‘Man on Fire’. The signs were very, very promising going into the now hotly anticipated release of third album Runes. That the resulting product has proven something of a mixed bag, then, is a disappointment. In the run up to its release the band promised a move towards the sound of the early melodic metalcore greats (Killswitch Engage, As I Lay Dying et al) that first inspired them. Much of the guitar work does suggest such a transition – the noodling melodies on the chorus of ‘Shadow, A Creator’; the magnificent soloing on ‘Our Gift’ and ‘Watcher’ – this change giving talented new lead guitarist Kristan Dawson a great showcase for his obvious chops. On the other hand, they still whip out some of the hardest hitting breakdowns this side of Gojira, ‘Of Glory’ concluding with perhaps the most brutally effective of the band’s entire discography. Jason Cameron remains one of the most unique clean vocalists in the genre thanks to his passionate baritone, while Daniel Winter-Bates holds his own nicely in the screamed sections. What, then, is the problem? The main issue, one that has always plagued this group, is that while they differentiate their formula between albums they fail to really do so within them, and so twelve of the thirteen tracks on Runes are frustratingly similar. The longer the album goes on the more monotonous it feels, weaker songs like ‘Under the Sun’ merely bloating the runtime. The one respite comes from short, serene interlude ‘Divine Breath’, bizarrely buried at the tail end of the album where it would have made far more sense to include it in the very middle. Structurally this album is greatly flawed, and is simply left to go on too long. More interesting guitar parts and a few hooky choruses (not as many as on Union of Crowns, notably) fail to absolve the tedium. Sadly, the impression given off by Runes is that Bury Tomorrow are a one trick pony – they can be very good at writing aggressive but palatable traditional metalcore, but can’t broaden their talents enough to make a multi-faceted album that’s consistently enjoyable from start to finish. In a golden era of British metal where acts like Architects, While She Sleeps and The Defiled are churning out groundbreaking and unique music, the conventional approach of Bury Tomorrow feels one-dimensional. Progress has been made on this latest album, but not enough to convincingly earmark them as future major players in the heavy music game.